I wrote this for an outlet, but it has not been published, so I am posting here. Last month, the Minister for Education announced that former Chief Justice of the High Court, Robert French, would conduct an inquiry into free speech at Australian universities. Although the scope of the inquiry seems to be wide, Tehan seems to be have been driven to launch this inquiry after concerns were raised in the press about students protesting against certain speakers at events on campus. Students protesting against speakers, such as Bettina Arndt, have been accused of shutting down debate and using the threat of public disorder to force event organisers to pay a substantial amount of money for security or to cancel the event. At a time when Tehan and his predecessor, Simon Birmingham, were being heavily criticised for their intervention in the grant awarding process of the Australian Research Council and denying funds to 11 projects that had been recommended to receive funding, an inquiry into freedom of speech and academic freedom at Australian universities seemed a perplexing choice. For many in the higher education sector, it seemed like another culture war tactic by a government that was appealing to its conservative base. Speaking about the inquiry, Tehan suggested that one of the outcomes of the inquiry may be an adoption of an Australian version of the Chicago Statement, an initiative by a small cluster of US universities to commit to the maintenance of freedom of speech and academic freedom. Focus on the Chicago Statement has been a recent development in the discourse on freedom of speech at universities in Australia, although the statement was first adopted by the University of Chicago in 2012. Professor Kath Gelber from the University of Queensland has argued that an adoption of the principles of the Chicago Statement by Australian universities would be ‘unlikely to be of benefit in resolving the issues with which the minister appears to be concerned’, and called the whole inquiry ‘expensive and unnecessary’. The Chicago Statement was given significant attention in the Institute of Public Affairs’ two recent reports into free speech on campus, with the IPA’s ‘audits’ of free speech at Australian universities inspired heavily by similar reports on US and UK universities by the Foundation for Individual Rights in Education and spiked! respectively. The recent interest by both the IPA and the Liberal government in the Chicago Statement could be seen as another indicator of the importing of culture war tropes from the United States and the United Kingdom, particularly around the issue of free speech on campus. As the discourse of free speech at Australian universities seems heavily influenced from other countries, it would be wise to consider how the debate on free speech and ‘no platform’ has recently developed in the UK, where the then Universities Minister, Jo Johnson, launched an inquiry into this topic late last year. The concern over free speech at universities has existed in Britain for a long time, with complaints about violent students shutting down freedom of speech on campus since the late 1960s. 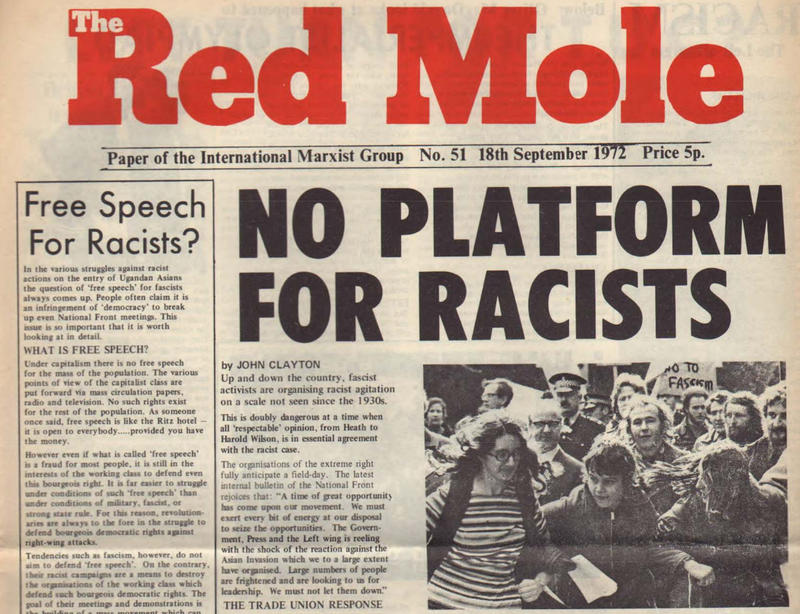 When the National Union of Students implemented a policy of ‘no platform’ for fascists and racists in 1974, many commentators and politicians viewed this a form of ‘left-wing fascism’. The ‘no platform’ policy has existed more or less in tact since the late 1970s and is routinely held up by conservatives and libertarians as an infringement upon the freedom of speech, portraying controversial speakers as hostage to the proponents of ‘identity politics’ and ‘grievance studies’. The Thatcher government attempted to legislate against this in 1986 by mandating that universities had a duty to ensure freedom of speech, with possible disciplinary actions taken against universities which failed to comply with the legislation. However student unions were, and are, separate legal entities to the universities and the legislation did not apply to them. Although there have been controversies over the application of the ‘no platform’ policy at British universities since the 1970s, media attention around this subject seems to have grown in recent years, possibly exacerbated by social media. Amongst the possible reasons for this is the resurgent far right across the globe and greater opposition to this, including actions to keep racists off British campuses. Another is that there has been growing opposition to the presence of trans-exclusionary feminists, such as Germaine Greer and Julie Bindel, on campuses and there has been a significant spotlight on the application of the ‘no platform’ policy by individual student unions and groups to these speakers. At the same time, the Conservatives under David Cameron significantly revised the Prevent strategy, which was first devised after the July 2005 bombings to stop the propagation of radical and extremist ideas, including at universities. As a 2015 House of Lords Library Note shows, this was the main concern about the infringement upon freedom of speech until recently. It has been contested by a number of scholars and commentators that Prevent is much more damaging to free speech and academic inquiry than ‘no platforming’. In October 2017, Jo Johnson called for the newly established Office for Students (OfS) to ‘champion free speech in UK universities’ and the following month, he announced that a parliamentary inquiry would be held. With over 100 pieces of written evidence submitted and over 35 people presenting oral testimony to the Joint Committee on Human Rights, the inquiry went from December 2017 to March 2018. In comparison with the discourse surrounding the Australian inquiry, there was little, if any, mention of the Chicago Statement by any those giving evidence. The inquiry’s report found that while there had been incursions on ‘lawful free speech’, the committee ‘did not find the wholesale censorship of debate which media coverage has suggested’. The report did, however, call for greater intervention by the Charity Commission against student unions that ‘inhibit lawful free speech’ and recommended that ‘[e]ffective action should be taken against protestors’ who attempt to disrupt or shut down events. It was suggested that the OfS take over from the Charity Commission in regulating student unions and publish an annual report on the topic of free speech at universities. In October 2018, a BBC Reality Check story, using FOI documents, showed that the number of incidents where free speech was curtailed at British universities was very small. Receiving responses from 120 of the 136 universities in the UK, the BBC reported that since 2010, there were only six occasions ‘on which universities cancelled speakers as a result of complaints’. The outcome of the Joint Committee on Human Rights’ inquiry, as well as the figures provided by the BBC, suggest that the concern around freedom of speech on university campuses is being promoted by conservatives and libertarians amidst a wider culture war and not driven by what is actually concerning both students and academics in higher education. Although Dan Tehan has launched a similar inquiry into free speech at Australian universities, the UK experience indicates that such an inquiry is not needed and reveals a government intent on unwisely interfering in the university sector. On 9 September 1934, a BUF rally at Hyde Park was opposed by a massive anti-fascist counter-demonstration, coming a few months after anti-fascists attempted to disrupt a BUF rally at Olympia and after a summer of similar confrontations across a number of metropolitan areas in England. This post is based on an early chapter from my book project on the history of no platform, to be published by Routledge’s Fascism and Far Right series. The British Union of Fascists (BUF) was formed by Oswald Mosley in late 1932 and it grew exponentially in its first years, with nearly 50,000 members allegedly joining. Enjoying support from Lord Rothmere’s Daily Mail and other sections of the Conservative right, Mosley attempted to establish the BUF through a series of public meetings, demonstrating its supposed mass support at rallies, inspired by Mussolini and Hitler. There were frequent mobilisations by anti-fascists against these public meetings and rallies in the early years of the BUF, culminating in two events in 1934 that solidified the militant anti-fascist approach of physical confrontation and also revealed the violent nature of the BUF. Fascists looked back with satisfaction on the ‘beating’ they had given the ‘Reds’ and claimed that it had restored ‘free speech’ in Britain. Anti-fascists regarded it as the moment when they unambiguously exposed the brutal face of fascism and condemned it thereafter in the eyes of all decent Englishmen. [T]he workers’ counter-section will cause them to tremble. All roads lead to Olympia to-night. A counter-demonstration by anti-fascists was held outside the venue, while anti-fascists heckled the speakers, including Mosley, and sought to disrupt the meeting. These disruptions were staggered over the evening, so to ensure the maximum disruptive effect. As The Times reported the following day, ‘The campaign of interruption had been well planned so that it should affect every part of the meeting in the course of the evening’. Stewards at once made for the offenders. If they resisted ejection the incident at once became an affair of fisticuffs and, if the victim remained standing at the end of his resistance he was seized ju-jitsu fashion and dragged out. Quite a number were borne out limp bodies after the frays. Once ejected, there were a number of arrests of anti-fascists outside the venue, where further violence was meted out by the police. The Daily Workerreported that outside Olympia, ‘seething crowds of thousands of workers kept up a continual anti-Fascist uproar, despite the enormous special concentration of police forces which had been gathered… for the Blackshirts’ protection’. The following day, the newspaper stated that 24 anti-fascists had been arrested, compared to one BUF supporter, claiming that this was ‘a striking fact, which [spoke] volumes’ about the differing treatment by the police towards the BUF and the CPGB. For over three weeks certain Communist and Socialist papers have published incitements to their readers to attack this meeting. The result was that a large Red mob gathered outside the hall for the purpose of intimidating those who entered, and very many of the audience were in fact jostled before they managed to enter the meeting at all. Terrific scenes were witnessed at Olympia last night, when the workers of London staged a mighty counter-demonstration to the Mosley Fascists. Mosley’s carefully-planned arrangements were turned into a complete fiasco. There was an outcry by some in the press and some politicians at the violence witnessed at Olympia, which has been documented by a number of scholars. For example, The Times quoted Conservative MP Geoffrey Lloyd as declaring, ‘I am not very sympathetic to Communists who try to break up meetings, but I am bound to say that I was appalled by the brutal conduct of the Fascists last night’. Although a number argued that the tactics of the anti-fascist protestors was just as deplorable as the actions of the BUF stewards. The Timesreported on debates in the House of Commons in the aftermath of Olympia, summarising that ‘members were about equally divided between unqualified condemnation of alleged Fascist brutality towards interrupters, and the feeling that allowances must be made for those who had been sorely provoked by Communists’. Rajani Palme Dutt, a leading CPGB figure, wrote in his editorial for Labour Monthly that it was only because of the anti-fascist demonstrators that ‘the eyes of millions’ had been opened ‘to the real character of Fascism’. Dutt proclaimed, ‘It is solely thanks to their stand that the present universal outcry against Fascism has developed, where before there was silence or indifference or amused toleration’. The truth is that while the violence alienated some people, it also added to the appeal of the BUF among the young and militant anti-Communists, with the result that the organisation experienced a major turnover of membership during 1934-35. Whether the violence turned people away from the BUF or attracted them to it, it was clear that violence was an inherent part of the BUF’s programme. The violence meted out to anti-fascists who broke up the meeting at Olympia roused the anti-fascist movement. Dave Hann wrote, ‘[a]nti-fascists had certainly taken a beating at Olympia but their growing movement responded in force, with an increase in the number of BUF public appearances interrupted by anti-fascists and the number of people involved in anti-fascist activity. By the latter months of 1934, the anti-fascist movement was confident of disrupting the BUF’s staged rallies and while expecting fascist violence and police intimidation, were also confident that popular sentiment (particularly amongst workers) was turning against Mosley. Incitement to violence and the carrying out of the most bestial brutality is the stock-in-trade of the Blackshirt thugs of Mosley. Olympia showed this plain for all to see. ‘Should any violence take place on Sunday with regard to the great anti-Fascist demonstration’, the Daily Worker editorial declared, ‘then the responsibility dfor this rests on Mosley’s gang’. With the experience of Olympia in recent memory, the CPGB readied itself for potential violence, while at the same time, it warned against unnecessary violence. Jon Lawrence has suggested that this was part of the CPGB’s attempts to build the United Front with the ILP and a general shift away from violent confrontation by the Party leadership. However it could also be argued that the CPGB (and the ILP) had learnt the lessons of Olympia and did not want individual anti-fascist protestors from suffering the same level of violence at the hand of BUF stewards or from the police. In the end, there was a massive turnout against the BUF at Hyde Park (between 60-150,000), with ‘much booing, heckling and ridicule from anti-fascists’, but ‘no serious disorder’. Two days later, the Daily Worker reported that 18 people had been charged with a variety of offences after being arrested at the Hyde Park demonstration, down from around 24 after Olympia, but with much larger number of anti-fascist demonstrators. The Daily Worker called the demonstration at Hyde Park a ‘great blow against fascism’ and that Mosley’s rally had been ‘an utter fiasco’. Despite the Labour Party and the TUC not supporting the demonstration and the police presence to maintain order (or to protect Mosley’s Blackshirts), the large crowd swamped the BUF rally ‘in a sea of organised working-class activity’. On the other hand, the BUF claimed this was ‘the most remarkable display of the strength of Fascism ever seen in Britain’, but complained about the ‘intimidation of the opposition and the most definite attempts to create an impression that there would be considerable disorder in the Park’. Even if the large crowds were not dedicated anti-fascists as the CPGB proclaimed, the BUF were vastly outnumbered and failed to win over those who had assembled in Hyde Park. The momentum shifted away from the BUF after 1934, towards the anti-fascist movement, but also towards the National Government. As a number of a scholars have shown, the events of 1934 had led the National Government to debate laws regarding the policing of political meetings and public order, but shelved at the time. This was partly due to a reluctance by some politicians to curtail the freedom of political expression and partly because the BUF began to co-operate with the police. Martin Pugh also suggests that the BUF avoided large urban cities where there was more likely to be an anti-fascist mobilisation, preferring to hold meetings across provincial England. It was not until 1936, when Mosley and the BUF shifted tactics towards explicit anti-Semitism and trying to attract more working class supporters in the East End of London, that confrontations between anti-fascists, the police and the National Government reached a new crescendo with the ‘Battle of Cable Street’. Michael A. Spurr, ‘“Living the Blackshirt Life”: Culture, Community and the British Union of Fascists, 1932-1940’, Contemporary European History, 12/3 (2003) p. 309. Robert Skidelsky, Oswald Mosley (London: Papermac, 1990) p. 365. Daily Worker, 7 June, 1934, p. 1. The Times, 8 June, 1934, p. 14. Daily Worker, 8 June, 1934, p. 1. Daily Worker, 9 June, 1934, p. 1. The Times, 9 June, 1934, p. 11. The Blackshirt, 15 June, 1934, p. 3. The Times, 12 June, 1934, p. 14. R. Palme Dutt, ‘Notes of the Month’, Labour Monthly, July 1934, p. 390. Dutt, ‘Notes of the Month’, p. 390. David Renton, This Rough Game: Fascism and Anti-Fascism (Stroud: Sutton Publishing, 2001) p. 139. Stephen Dorril, Blackshirt: Sir Oswald Mosley and British Fascism (London: Penguin 2007), pp. 298-301; Martin Pugh, ‘Hurrah for the Blackshirts!’: Fascists and Fascism in Britain Between the Wars (London: Pimlico, 2005), pp. 156-163. Pugh, ‘Hurrah for the Blackshirts!’, p. 162. Dave Hann, Physical Resistance: A Hundred Years of Anti-Fascism (Winchester: Zero Books, 2013) p. 46. See: Matthew Worley, Class Against Class: The Communist Party in Britain Between the Wars (London: IB Tauris, 2017). Nigel Copsey, Anti-Fascism in Britain (London: Routledge, 2017) pp. 21-24. Daily Worker, 5 September, 1934, p. 1. Daily Worker, 8 September, 1934, p. 2. Jon Lawrence, ‘Fascist Violence and the Politics of Public Order in Inter-War Britain: The Olympia Debate Revisited’, Historical Research, 76/192 (May 2003) pp. 259-261. Copsey, Anti-Fascism in Britain, p. 26. Daily Worker, 11 September, 1934, p. 1. Daily Worker, 10 September, 1934, p. 1. The Blackshirt, 14 September, 1934, p. 1. Pugh, ‘Hurrah for the Blackshirts!’, pp. 169-170. To Guardian journalist Simon Jenkins, just over thirty years ago is too far into the past for an inquiry into the events at Orgreave in June 1984, when the police reacted violently to striking workers in South Yorkshire and led to the arrest of 95 miners, as well as a number of people injured. Jenkins argues that “we know” what happened at Orgreave on that day, and that it should be left in the past – even though no one in a position of authority has been held accountable for excessive force used by the police against the striking miners. Anyway ‘[t]here were no deaths at Orgreave’, he says, so an inquiry, like those held into Bloody Sunday or Hillsborough, is unnecessary. But this assumes that the only reason to have an inquiry into police actions is when there is a death involved – isn’t the likelihood of excessive force being used by the police en masse enough of an issue to warrant further investigation? Jenkins is right in that government inquiries often don’t led to any significant reform or ‘lessons learned’. 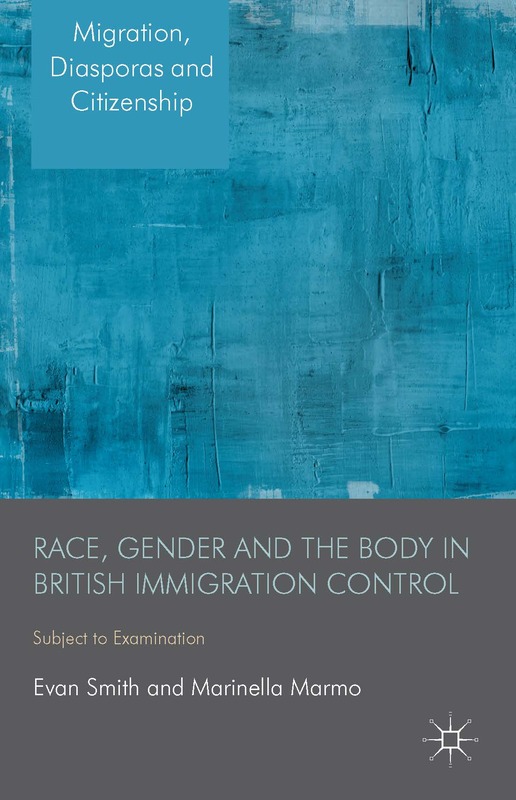 Even the stand out inquiries of Lord Scarman into the Brixton Riots of 1981 and the 1999 Macpherson Inquiry into the Investigation into the Death of Stephen Lawrence have been criticised for their limited impact upon the policing of ethnic minority communities in the UK (especially in the wake of the 2011 riots). But most inquiries held are short term affairs, announced by the government of the day to placate public opinion and often to appear to be ‘doing something’. A swathe of criminological and public policy scholarship has proposed that public inquiries are foremost exercises in the management of public opinion, rather than missions to find the ‘truth’ behind an incident or to determine accountability. Between the Scarman Inquiry into the Events at Red Lion Square in 1974 and the Macpherson Inquiry in 1998-99, there have been numerous inquiries into the actions of the police (and other government agencies) that have resulted in disorder, injuries and even death. Besides the Scarman Report in 1981 and the Macpherson Report almost 20 years later, most inquiries have left little mark on police practice. There are a number of incidents involving the death of people involved in interactions with the police, such as that of Blair Peach in 1979 and Ian Tomlinson in 2009, where there has been a coronial inquest, but no wider inquiry, even though people have demanded it. But an inquiry into Orgreave is likely to be much more far-reaching than those held immediately after the fact, similar to the Saville Inquiry into Bloody Sunday or the Hillsborough Independent Panel. These inquiries were held after the initial inquiries, the Widgery Report into Bloody Sunday in 1972 and Taylor Report into Hillsborough in 1989-90, were seen to be deficient by subsequent governments. Both of these inquiries were held over years, rather than weeks or months, and had legislation specifically introduced to open many documents that had previously been classified. In the end, these inquiries identified those who should be (or should have been) held accountable for these tragic events and delivered some form of justice to the relatives of the victims. Jenkins suggests that these were merely costly exercises in legal navel-gazing and that the cost of both inquiries could have been better spent on been given to the relatives of the victims and/or to their communities. However what had driven those pushing for the events at both Bloody Sunday and Hillsborough to be re-examined was not compensation, but for those responsible to identified and where possible, held accountable in some way. This is the purpose of a proposed inquiry into the events at Orgreave on 18 June 1984. Opposite to Jenkins’ argument, we don’t know the full story of what happened on that day. We have footage, we have witness testimony and the paperwork of those who were dragged through the courts, but we don’t have the police side of the story (or at least the full story). Despite thirty years since the event passing, no documents relating to Orgreave have been made open by the National Archives at Kew and the police have refused several previous FOI requests. Like the documents examined by the Hillsborough Independent Panel, all police and government papers relating to the events at Orgreave should be released to an inquiry and at the completion of said inquiry, these documents (with the necessary redactions) should be digitised and made available for public viewing. Jenkins says there should be a statute of limitations on inquiries into the past, writing ‘History is for historians’. He seems to be proposing that there is a clear line between contemporary politics and ‘the past’, but it is not so clear-cut. Thirty years ago is not that long ago and there are still people who were involved in police actions on that day in 1984 who could be held accountable in some manner. There are still people affected the actions of the police who are looking for some kind of ‘justice’ and official acknowledgment of what occurred, particularly how much was planned and how far the authorities went in the aftermath to absolve themselves of any blame. Jenkins equates a possible inquiry with Tony Blair’s apologies for the slave trade and the Irish Famine, but this is false. The ‘Battle of Orgreave’ happened within the lifetimes for many of us, not 150-200 years ago. Orgreave is not merely history, but an important historical incident that needs to be fully investigated. Let’s hope that enough pressure is put upon Amber Rudd (or her successor) to reverse the decision for an inquiry not to be held. Photos by John Sturrock, originally from Socialist Worker. This article examines the reaction by the Australian Federal Government to the protest movements of the 1960s–1970s and their attempts to use public order legislation to thwart radical discontent in Australia. It argues that the Public Order (Protection of Persons and Property) Act 1971 was aimed at the threat of “violent” protests, particularly the tactic of the “sit-in”, and that to this end, the legislation was an overreaction to the actual threat posed by the protest movements at the time. It also shows that after a long gestation period, the Act was ill-equipped to deal with the changing nature of demonstrations in the 1970s, such as the problems caused by the erection of the Aboriginal Tent Embassy. Thus, after an initial flurry of use in mid-1971, the law has been seldom used since. You can find the article here. If you use academia.edu, you can access the article here. News came through this week that veteran anti-fascist campaigner Morris Beckman had died. Beckman had been involved in the 43 Group, a militant anti-fascist organisation set up in the late 1940s to combat Oswald Mosley’s Union Movement. The 43 Group worked alongside the Communist Party of Great Britain to fight the UM in the late 1940s and it can be argued that one of the reasons that Mosley fled to Ireland in the early 1950s was that the UM had encountered stiff anti-fascist resistance on the streets, led by these two organisations. Beckman’s account is worth reading, alongside Dave Hann’s history of militant anti-fascism – but the best account would still be David Renton’s book from 2000 on the subject. On the day itself the CP divided responsibility for different streets amongst its members, as well as establishing first-aid posts, information posts, and runners to carry messages to other sectors of ‘the front’. The rest, of course, is history. Mark Neocleous wrote in his study of fascism, ‘seeing fascism as a historical phenomenon that ended in 1945 or thereabouts… encourages a dangerous forgetting’. While Mosley and leading members of the BUF, as well as the leader of the tiny Imperial League of Fascists, Arnold Leese were interned during the Second World War, this did not happen to the majority of fascists. Although the War and internment were huge blows to British fascism, it did not end in 1940. Richard Thurlow correctly pointed out that the fascist organisations that existed in the inter-war period did not survive the War, but that did not stop Mosley and other fascists attempt to adapt fascism to the post-war period. From 1945 and 1951, Mosley’s Union Movement, alongside other fascist organisations and agitators, revived a campaign of violence and intimidation, with a programme that still ‘smacked of fascism’, despite attempts by the Union Movement to distance itself from the BUF. As the majority of British people were clearly hostile to fascism in the aftermath of the Second World War, the Union Movement was ‘always doomed to failure’, but as James Eaden and David Renton acknowledged, anti-fascists, including the CPGB, ‘can also claim some credit for having helped to hasten fascism’s demise’. In the post-war period, the Communist Party was a leading organisation in the anti-fascist movement after the ‘failure of the Labour Party to take a lead in the street campaigns against Mosley’. Alongside the CPGB were Jewish organisations, such as the Association of Jewish Ex-Servicemen and the Board of Deputies of British Jews, progressive organisations, such as the National Council for Civil Liberties (NCCL), and the radical organisations, such as the Trotskyist Revolutionary Communist Party (RCP) and the 43 Group. Home Secretary [Chuter] Ede had imposed a temporary ban on all political processions in London… Yet, as the Communist Party Executive pointed out, hundreds of police were being used to protect meetings by the fascist Oswald Mosley who was trying to re-establish his anti-semitic organisation. As E.P. Thompson wrote in a 1947 pamphlet, Fascist Threat to Britain, ‘It is quite clear that the fascists welcome the police at their meetings – not as a warning, but as protection from the justice of the people’. This did not prevent the Communist Party from demanding that the state be used to contain fascist activity. Arguing against the common assumption that ‘the police already have enough powers to deal with [the fascists]’, Thompson declared, ‘If they have, they should use them. If they have not, they should be given the powers they need’. 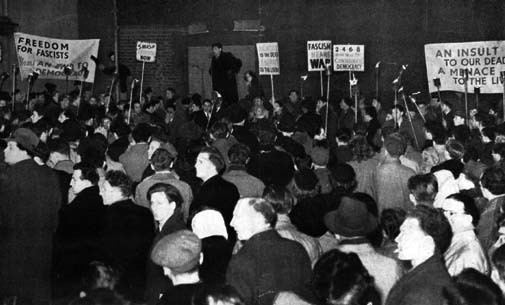 As the Labour Government was viewed as not dealing effectively with the fascist resurgence, the Communist Party, with its ‘reputation for anti-fascist work going back to Cable Street’, began anti-fascist work against Mosley and the Union Movement. However there was a move by the CPGB leadership away from the direct militant action of the 1930s, such as that witnessed at Cable Street, to a position of reliance upon the state. In Thompson’s pamphlet, the actions advocated by the Party did not include direct action, instead demands were made that ‘spreading of specifically fascist doctrine… be outlawed’, ‘spreading of racial hatred and anti-Semitism… be made a crime’ and that ‘existing laws… be strictly enforced’. Alongside this, the Party urged that other organisations ‘go on record for the outlawing of fascism’ and more immediately, ‘If the fascists come into your locality, get all the inhabitants to sign a petition of protest to the Home Secretary’. Nigel Copsey suggested two reasons for this move away from direct militant action. The first was that the ‘decisive action taken by the state’ against the British fascists during the Second World War led the CPGB leadership to believe that a ‘non-confrontational policy towards fascism was the most appropriate’. Secondly, the cautious post-war policy by the Communist Party should be read as a result of their support for the Labour Government in the early post-war years. 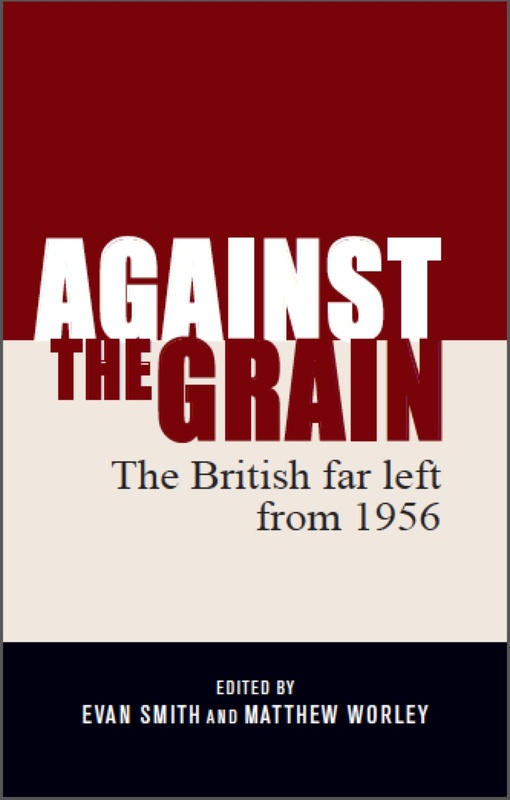 As part of the transformation by the CPGB to adjust to Britain’s post-war conditions, the Party leadership ‘officially discouraged any anti-fascist activity likely to give the Communist Party a bad name’. By demanding a state ban on fascism, the CPGB attempted to appear as a respectable political party. This reliance on the state and reluctance to be involved militant actions contributed largely to how the Communist Party anti-fascist campaigns throughout the post-war period. In the 1945 General Election campaign, the CPGB had proposed that anti-Semitism become a criminal offence, an attempt to attract support from the local Jewish circles and emphasise the Party’s anti-fascist stance. While a proposal for banning anti-Semitic propaganda and agitation was a practical task to deal with the immediate threat of fascism, the total banning of fascist organisations by the state was much more problematic. As seen with the 1936 Public Order Act, while the Government stressed that ‘any legislation would apply equally to the Left as well as to the Right’, in practice the state used this legislation ‘almost entirely… against anti-fascist protestors’. The CPGB bore the brunt of the state’s zealousness to keep the status quo and as David Renton has written, the state frequently used its laws to harass the CPGB while sympathising with the fascists. It was said that the 43 Group was a subversive Communist organisation… We were not connected to any organisation, but sometimes we worked with the Communists. They wanted to take us over… Sometimes we found ourselves attacking the same fascist meetings as the Communists. We would even pass information to them. Beckman wrote in his memoir of the 43 Group, ‘the enemy of our enemy was our friend, and the Communists were actively attacking the fascists’. The CPGB leadership could not publicly condone the actions of the 43 Group, but there was no disciplinary action against those Party members involved. The Communist Party and its anti-fascist work of the 1930s and 1940s has been largely identified with the Jewish population of London and the considerable Jewish membership within the Party. The relationship between the Jewish community and the CPGB has been well-documented by Henry Srebrnik, who described the Party’s anti-fascist legacy and its stature among East End Jews as tapping into a ‘specifically ethnic means of political expression’. For the Jews of East End London, their attraction to the CPGB was the Party’s ‘self-appointed role as a steadfast opponent to all manifestations of domestic fascism’. In the Stepney branch, one of the Party’s biggest, around fifty per cent of the one thousand members in 1945 were Jewish. As the Union Movement began to agitate in the early post-war period, Communist Party members and Jewish activists both fought against the fascist revival, utilising the memory of the Party’s anti-fascist work of the inter-war period. However by the early 1950s, the Jewish Communist subculture had fallen into decline, although as late as 1965, it was estimated that around ten per cent of the CPGB’s membership was Jewish. Yet I never felt happy with Jewish Communists. They were too sensitive, their feelings were too close to the skin. They were certainly among the hardest-working, most active members of the Party, but they made me uncomfortable. And a great many Gentile comrades felt the same way. After six years of anti-fascist activity, the Union Movement went into decline and in 1951, Mosley left Britain for self-imposed exile in Ireland. This can be viewed as the end of ‘classical’ fascism in the vein of the inter-war movement, although not the end of fascism in Britain (as the rise of the National Front demonstrated). The defining organisation for the post-war fascist movement was the League of Empire Loyalists (LEL), formed in 1954 by former BUF Director of Propaganda, A.K. Chesterton and an organisation through which nearly all the important figures of post-war fascism passed. However the fascists were now a response to the collapse of world imperialism and the decolonisation process. In the Cold War polarisation between Washington and Moscow, Britain had lost its significance as a world power and for the fascist organisations of the mid-1950s onwards, non-white Commonwealth immigrants became the new scapegoat for the fascists’ perceived threat to the ‘remnants of the British Empire and way of life’. Once Mosley left for Ireland in 1951, the other fascist organisations that existed were more influenced by the inter-war Imperial Fascist League’s Arnold Leese than Mosley, emphasising anti-Semitism and racism against Britain’s black immigrants. What characterised British fascism between 1951 and the formation of the National Front in 1967 was a series of splits into tiny organisations featuring the same individuals, the result of attempting to adjust fascism to post-war Britain and a succession of personal clashes. From 1957 onwards, the same names – Colin Jordan, John Tyndall, Martin Webster, John Bean, Andrew Fountaine – were involved in various groups, which despite numerous splits and different organisational titles, were only superficially distinguishable from each other, primarily the White Defence League (WDL), National Labour Party (NLP), British National Party (BNP), National Socialist Movement (NSM) and the Greater Britain Movement (GBM). Despite involvement in and brief notoriety from the anti-immigrant agitation of the Notting Hill riots, these fascists achieved little during this period. 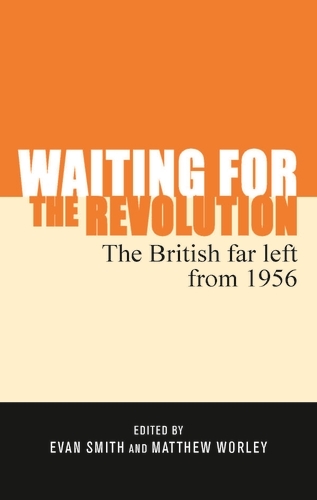 Copsey remarked that, ‘[f]or the most part, the 1950s in Britain were quiescent years for both fascists and anti-fascists’, despite appealing to populist anti-black racism. 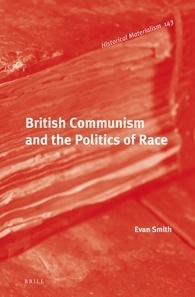 The focus of anti-racist activists, including those in the Communist Party, in the 1950s and 1960s was the mainstream prejudice against newly arrived Commonwealth immigrants.